It’s been a while since I wrote a D&Development post. While I have already covered two of my favorite campaign settings, Ravenloft and Dark Sun, I’ve only mentioned today’s entry, the world of Krynn, in a few posts here and there. I’ve wondered why this is so; I consider Dragonlance to be one of my favorite D&D-related things of all time. However, I am more of a fan of the novels than the actual gaming products, so perhaps that explains my lack of Dragonlance coverage so far. Nontheless, I am still quite fond of the setting from a gameplay perspective. 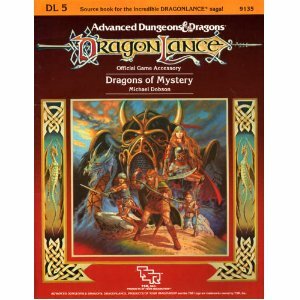 I was born in 1974, so by the mid 80s, when Dragonlance first hit the shelves, I was actually able to earn some money on my own. I mowed lawns and assisted my mother with her cake decorating business, using the money on trips to the mall, where I would usually hit up the comic shop, arcade, and bookstore. Looking for new Adventure Gamebooks one Saturday evening after we’d worked a wedding all day, I noticed a bright red book with an awesome title and even better cover art: Dragons of Autumn Twilight. This book served as an introduction to fantasy literature for me, and boosted my interest in D&D, too. I read all three of the Chronicles books that summer, and to say that I enjoyed them would be an understatement. The characters were so interesting to me; I realize they are archetypal and not especially complex, for the most part, but that didn’t bother me at the time (and doesn’t get my feathers ruffled too much now, either). The carefree kender Tasslehoff, the gruff dwarf Flint, the noble Knight Sturm… I loved them all. I adored Raistlin and Caramon, which should come as no surprise to anyone, and was especially intrigued by the way magic worked on Krynn. The idea that it was physically exhausting for Raistlin to cast spells, especially more powerful ones, was quite different than the wizards I had seen in video games and movies. This made the fanciful elements of the book seem so much more realistic. While the series has been criticized for its black and white depiction of good versus evil, I had no problem with it. The heroes worked together to help others and save the world, the villains were mean and treacherous, and that’s how I liked it. Classifying mages into colors by their alignment seems goofy on the surface, but it seemed ordered and structured, logical, somehow, to me. 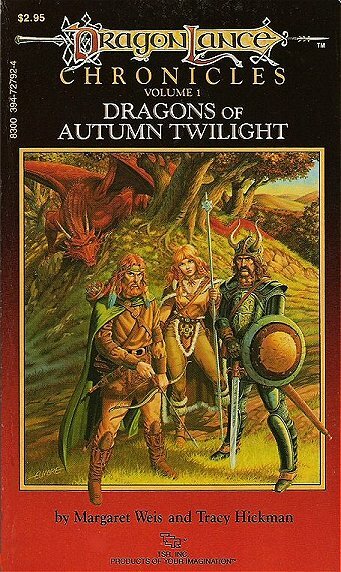 It might just be the nostalgia goggles affecting my judgement, but Dragonlance was so different than anything I had read, these flaws didn’t bother me at all at the time, and seem only minor upon rereading the series today. Perhaps the most appealing aspect was the focus on dragons throughout the story. The idea that there were different kinds of dragons, each with a different breath weapon, habitat, and disposition, blew my mind. Of course, this all came from the Monster Manual and other D&D products, but I’d never seen it used in a story like this. A large-scale war, with dragons, both evil and good, Knights and draconians, wizards and warriors, all in conflict with one another, was fascinating. My daydreams were filled with such images for many months. I continued to read the Legends series, and loved it. The blending of time travel with the fantasy genre and the tragic tale of Raistlin’s attempt at godhood kept me turning the pages at a frantic pace. My appreciation for Dragonlance was so great that I found myself buying the game products, even though they didn’t really work too well with the Basic D&D set I was most familiar with. Reading the events of the Chronicles books in module form was interesting to me, but my favorite was DL 5 Dragons of Mystery. I poured over this sourcebook for more information about the world of Krynn for many hours. I only ever played in one Dragonlance campaign that I can remember. There were only three of us, and we all took on the role of magic users. I wanted to be (surprise!) a neutral human mage. However, during an introductory solo play session detailing my characters Test, Dalamar himself appeared and offered to take me as an apprentice if I would don the black robes. I of course accepted, and the campaign thus began with a party of three wizards, one of each color robes! When you are thirteen, it doesn’t get any better than that, does it? While most of my Dragonlance memories are fond ones, there is one that still bothers me to this day. I have a tendency to get almost obsessive over one thing at a time, and focus on it to the exclusion of other activities. I am better about it now, but when I was younger, this caused some concern for my parents. During the height of my Dragonlance-crazed years, my father called the school librarian and asked if the books were appropriate for a junior high student. She declared the books to be “too adult”. Perhaps she was just buying into the anti-D&D hype (which my parents did not, thankfully) but in any case, my parents took away the Dragonlance books from me. I was devastated, to say the least. While I know my parents did a great job raising me, I still disagree with this one decision. They should have read the books themselves first before taking them away from me. While I certainly went overboard with Dragonlance books, I don’t think it was unhealthy at all. I ended up just moving on to the next big thing, probably comics or Nintendo, and obsessed over that instead. Within a few years, my parents relented, and I purchased and reread the books again, though at a more reasonable pace. It wouldn’t be the last time I would enjoy doing so. 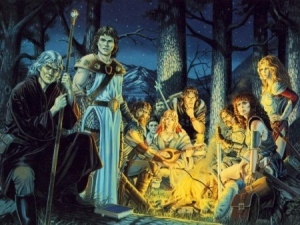 The best Dragonlance experiences I have aren’t childhood memories, but are much more recent. Several years ago, I shared my Chronicles books with my oldest son, and he enjoyed them, and the Legends series too, though certainly not as much as I did when I was a kid. Over the past year, my youngest son has really enjoyed anything to do with D&D. He recently bought a copy of Dragons of Autumn Twilight for his Kindle. He will turn eleven next month, a bit younger than I was when I first read it. He loves the book. We’ve had great conversations about it, and it’s interesting to see how his opinions are so different than mine. Tanis is his favorite, and he wrote a character report about him for school. Sharing one of my favorite book series with my children has been an amazing experience, one that I will treasure forever. I owe a great portion of my identity as a Dungeon Master to the Dragonlance saga. An emphasis on dragons and a clear line between good and evil are appealing to me, and I find myself using both concepts in my games often. While I have not followed many of the newer books, I still reread the first two trilogies every few years. While I am disappointed in the lack of Dragonlance products for 4th Edition, I’m hopeful that many of the classics from the past will be reprinted or released digitally soon, and will be easily integrated into D&D Next campaigns. Previous Is D&D Next Having an Identity Crisis?